This new Power Bronzer version of the Virtual Sun tanning bed uses our newest tanning lamp, the Power Bronzer 100. It uses a combination of features to deliver more UVA and UVB than any regular tanning lamp. Up to TWICE the bronzing action of generic lamps! Each lamp has its own built in reflector for maximum intensity. This means that all the tanning power is forced out of the front of each lamp, instead of simply bouncing around the inside of the bed. This alone guarantees 35% more power. Next, we put this reflector inside our Custom Plus tanning lamp, which is 20% stronger than our regular bronzer lamps. When you put them together, you get a lamp that is designed from the ground up to deliver better than salon results, all in the convenience of home. Another advantage of the Virtual Sun 32 is that it will just plug in the wall. Our advanced electronics get the most out of every watt of power, so you get fully tanning potential, without wasting electricity. They cost about 1/2 as much to operate as old fashioned Wolff type tanning beds, yet deliver more power to the tanner. Left: Typical lamps emit light in all directions. Some is reflected by aluminum reflectors. 30% to 50% is simply lost forever. Right: SunMaster Power Bronzer 100 lamp forces all the light to exit the front of the lamp. The blue arrows indicate the extra UV that will reflect back to you. 95% of the light reaches the tanner. 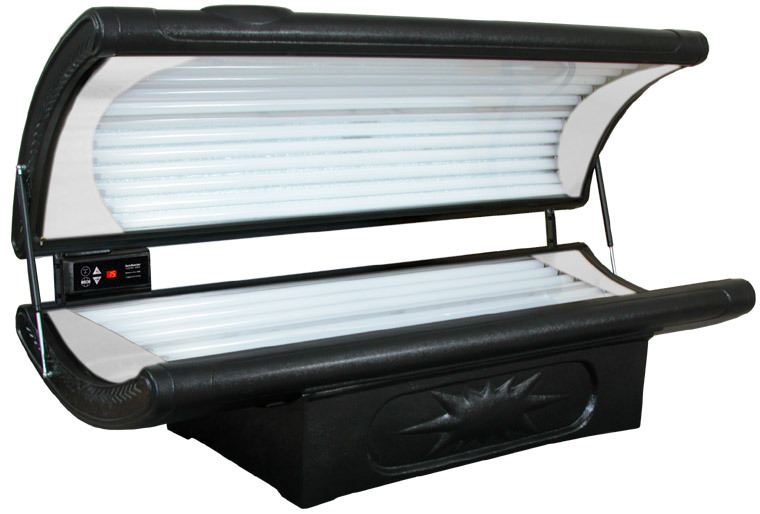 RUVA lamps (Reflector UltraViolet A) are used in the large mega beds you see at higher quality salons. Typically these are beds with 40 or more lamps. SunMaster / Virtual Sun was the first to bring them into the home with our original Limited Edition beds back in 2004, but this new Power Bronzer 100 lamp is considerably stronger, faster tanning, and now costs hundreds of dollars less than the original Limited Edition beds. There has never been a tanning bed with these advanced lamp technologies in this price range. Your new Virtual Sun Power Bronzer 32 tanning bed comes with a fully digital, 15 minute timer for fast, deep tans in less time. Each is made in the USA and shipped direct from our factory to your door. Two people can easily assemble the system in 30 minutes. Then you just plug it in: No 220v or dedicated circuit is required. Fully 11" longer than most Wolff 24 lamp beds. Gen III electronics are the most efficient ever. Virtual Sun is the Value Leader! Because of the volume of tanning beds we produce, we can give you MORE bed for LESS money. Compare it to any tanning bed and see for yourself: We are so confident that you will LOVE your new Virtual Sun that we back each one with a 30 Day Money Back Guarantee. No other manufacturer offers this. Newer technology, more standard features, and guaranteed best value for your home tanning needs: Virtual Sun 32. We are currently back-ordered on this unit. Call us at 1-800-274-1744 for availability information.